We are very excited to announce our partnership with United States Dressage Federation Bronze, Silver, Gold, and Gold Freestyle bar Medalist - Reese Koffler-Stanfield! Reese will be our Lexington Representative and her Equicizer will be available for prospective customers to see and try. Reese is a nationally and internationally ranked professional High Performance competitor and a United States Dressage Federation Certified Instructor/Trainer through Fourth Level. If you are local and interested in purchasing an Equicizer but would like to try one first, please contact us directly through email at info@equicizer.com or by phone, 419-663-1472 and we can arrange a meeting. To learn more about Reese and Maplecrest Farm, visit their website! As you are reading this, we are traveling to the Kentucky Horse Park in Lexington, KY for the Thoroughbred Makeover and National Symposium, which takes place from October 26th - 30th. If you're in the area, we hope you will come out, say hello, and hop on an Equicizer! We will be in booth 38B in the TCA Covered Arena with the other vendors. For more information, check out last week's "Wooden Horse Wednesday" for more details about the event and where you can see us! Don't forget to get your Christmas orders in soon! 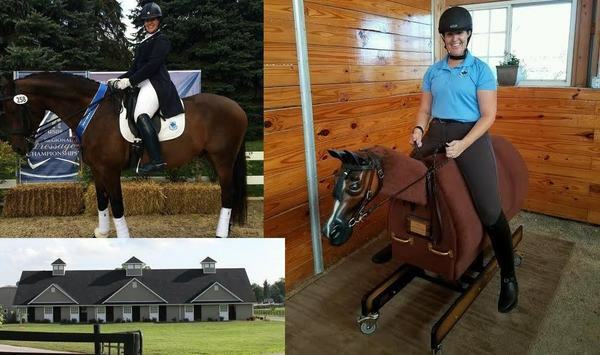 See below for easy links to learn about and purchase an Equicizer Elite, Equicizer Classic, and the all-new All-Terrain Equicizer Cart! The Equicizer makes a great gift for a wide variety of people. It can be used at home for therapy or to increase fitness. See our Wooden Horse Wednesday blog for all of the wonderful applications on how the Equicizer can be used! Healing Horses Singapore shared this wonderful photo of a student stretching on the Equicizer at their facility along with the inspiring quote: "No matter how long it takes, it will get better. Tough situations build strong people in the end." Please subscribe to our newsletter mailing list! Follow this link to our website and enter your email. We put out newsletters about once a month or so and we will never send you spam! Our newsletters feature upcoming appearances, partnerships, special offers, new products, contests, and updates.